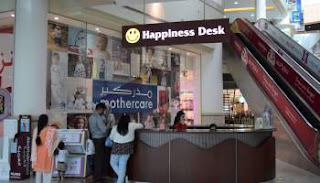 Socrates: Happiness at the shopping mall? Myself, I was very happy. As I wandered around taking note of everything I did not need, I realized that it doesn't take much to be happy. Perhaps our focus on enriching our material wealth distracts us from enriching our souls. Perhaps this contributes to the elusiveness of happiness.